All these low calorie dishes lately have me craving something naughty! 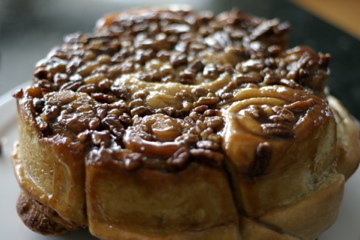 What could be naughtier (calorie wise) than a good ole Ooey Gooey Sticky Pecan Caramel Roll! 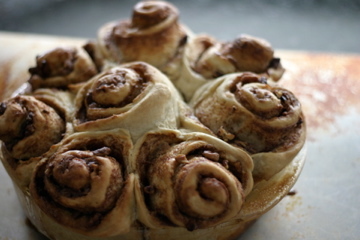 You may use the dough now to make theses rolls but it will be sticky. I put mine in the refrigerator and made them the next day. Dust the surface of the refrigerated dough with flour and cut off a 1 1/2 pound (cantaloupe-size) piece. Dust the piece with more flour and quickly shape it into a ball by stretching the surface of the dough around to the bottom on all four sides, rotating the ball a quarter-turn as you go. Leave the left-over dough in the fridge and make some Artisan Bread for dinner, tonight! With a rolling pin, roll out the dough to a 1/8-inch thick rectangle. As you roll out the dough, use enough flour to prevent it from sticking to the work surface but not so much as to make the dough dry. 6 Tbsp. unsalted butter, softened - I left mine out overnight so it would be ready for prep when I woke up. Cream together the butter, salt, and brown sugar. Spread evenly over the bottom of a 9-inch cake pan (I found it easiest to spread with an offset spatula). Scatter the pecans over the butter-sugar mixture and set aside. Cream together the butter, sugar, and spices. Spread evenly over the rolled-out dough and sprinkle with the chopped nuts. Starting with the long side, roll the dough into a log. If the dough is too soft to cut, let it chill for 20 minutes to firm up. With a very sharp serrated knife, cut the log into 8 equal pieces and arrange over the pecans in the pan, with the "swirled" edge facing upward. Cover loosely with plastic wrap and allow to rest and rise 1 hour (or just 40 minutes if you're using fresh, unrefrigerated dough). Meanwhile, eat some Fresh Fruit with Lime Gastrique to take the edge off of your hunger! Twenty minutes before baking time, preheat the oven to 350. If you're not using a stone in the oven, 5 minutes is adequate. Make more coffee. Put something down in the oven to catch the ooey gooey overflow and bake about 40 minutes, or until golden brown and well set in center. While still hot, run a knife around the inside of the pan to release the caramel rolls, and invert immediately onto a serving dish. If you let them set too long they will stick to the pan and be difficult to turn out. In a large bowl or plastic container, mix yeast and salt into 3 cups lukewarm water (about 100 degrees). Stir in flour, mixing until there are no dry patches. Dough will be quite loose. Cover, but not with an airtight lid. Let dough rise at room temperature 2 hours (or up to 5 hours). *You may use the dough now to make theses rolls but it will be sticky. I put mine in the refrigerator and made them the next day. Dust the surface of the refrigerated dough with flour and cut off a 1 1/2 pound (cantaloupe-size) piece. Dust the piece with more flour and quickly shape it into a ball by stretching the surface of the dough around to the bottom on all four sides, rotating the ball a quarter-turn as you go. *Leave the left-over dough in the fridge and make some Artisan Bread for dinner, tonight. Hi Dee! This is BEAUTIFUL and I'm sure it was so delicious! I'm trying to cut down on sweets but how can I when I see something so yummy! Thanks Nami! Sorry about the flirtatious pictures :) It was very yummy. That was my first successful attempt at breakfast rolls. It just goes to show how a good recipe makes a huge difference. Dreamy! We've been having such rainy weekends around here and these are the perfect thing for a lazy rainy sunday. Definitely looking forward to trying this recipe! Absolutely dreamy! This would be a perfect rainy day breakfast :) I say go for it! Great rolls. I love the combination of relatively plain dough with the sweet, sticky filling. I smiled at the instruction to "make more coffee". It was a good combination. They weren't to sweet, they were just right!